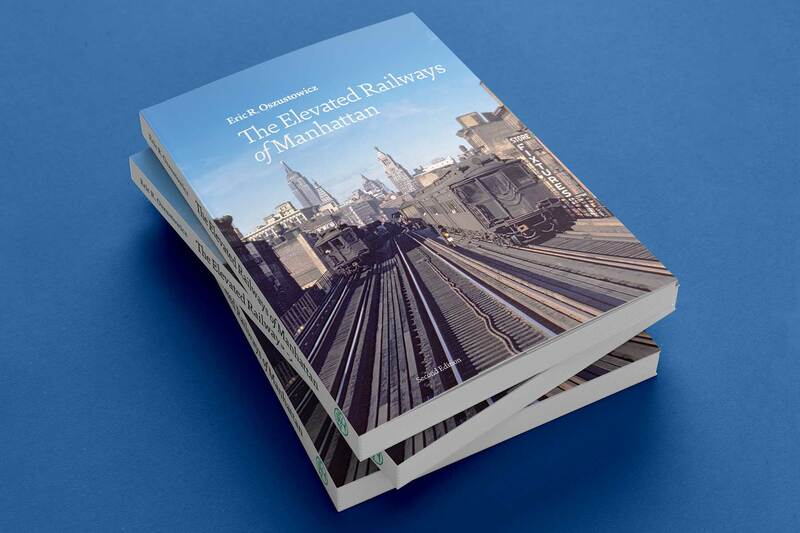 The Elevated Railways of Manhattan, 2nd Edition (2016). A typical Manhattan Railway steam train turning south onto Front Street from Coenties Slip in 1894. A northbound train of MUDCs has just crossed the Harlem River and entered The Bronx. 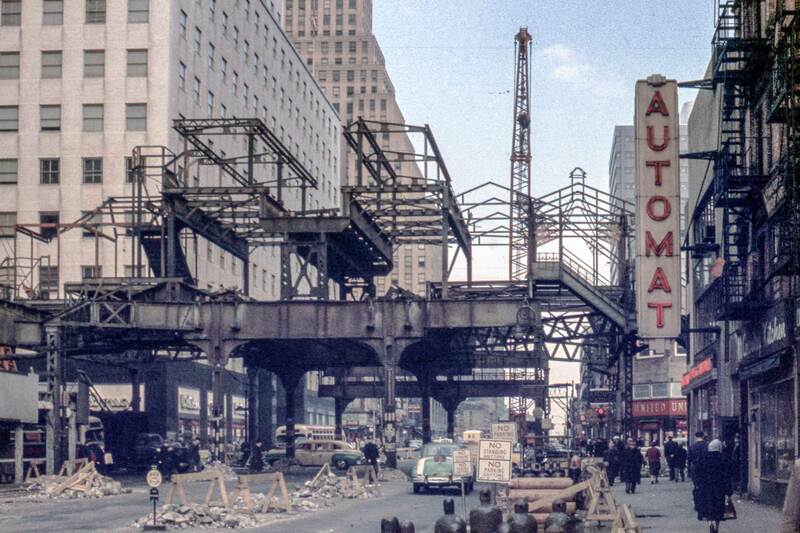 This is a post-1940 view, so only Third Avenue trains are operating. Looking north at 110th Street and Eighth Avenue (Frederick Douglass Boulevard). 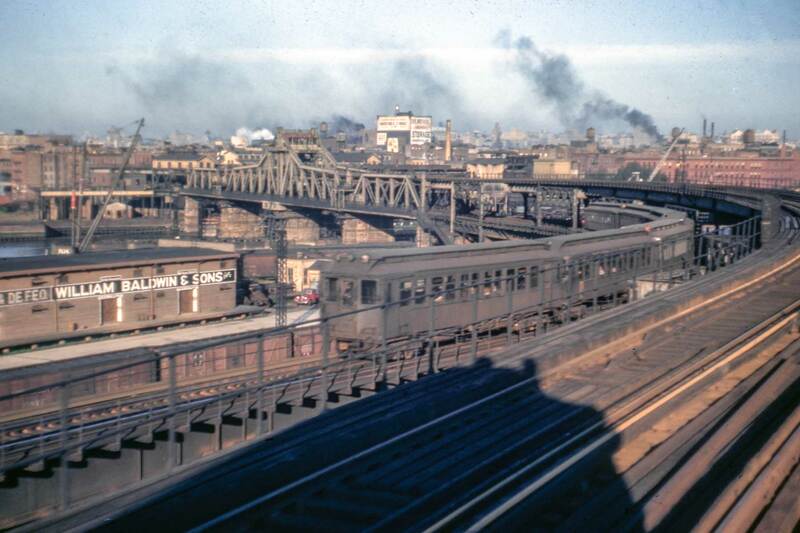 A train of R12 and R14 cars is seen entering Queensboro Plaza during the 1950s or early 1960s. 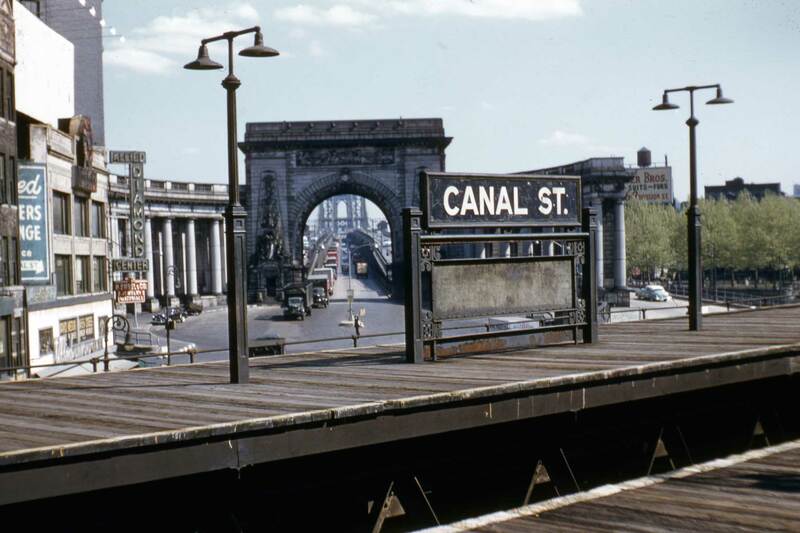 Looking at the Manhattan Bridge approach from the Canal Street station on May 9, 1955. 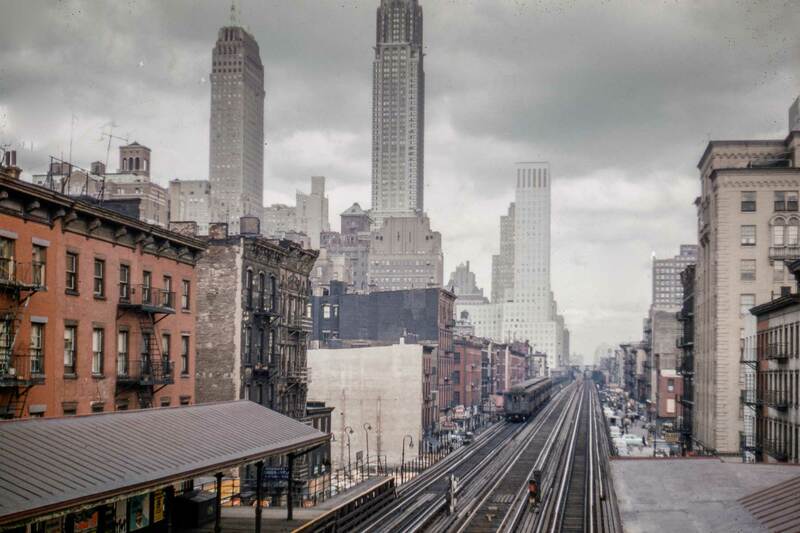 Looking north from 34th Street and Third Avenue in the late 1940s or early 1950s. During demolition at Third Avenue and 42nd Street looking north. 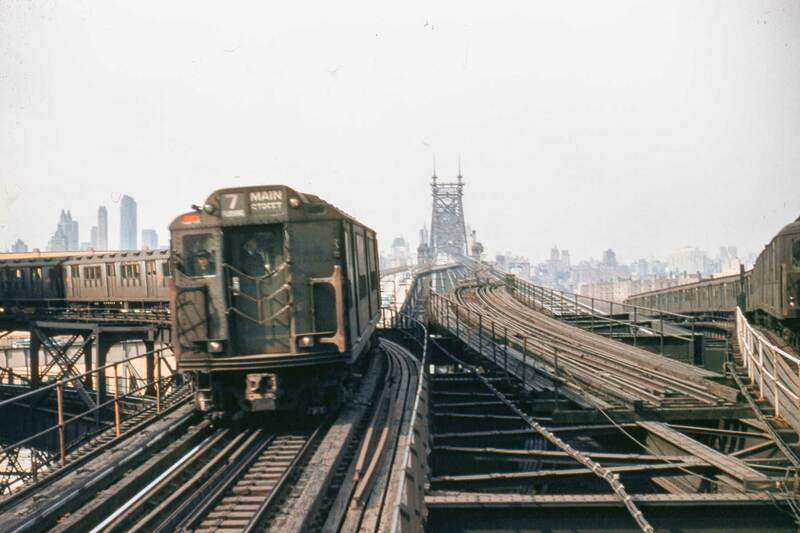 A May 1955 view of MUDC 1266 northbound at the 59th Street station. A view closer to the bridge entrance. 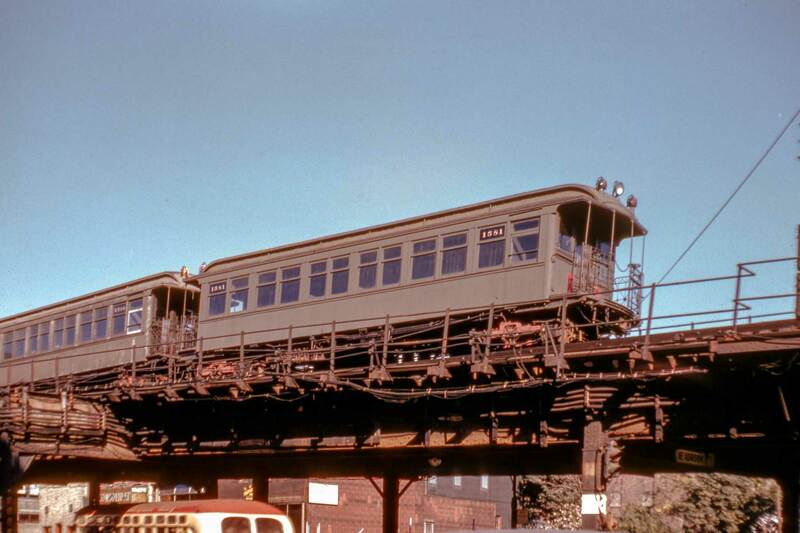 A rare color view of gate cars on the Third Avenue Line. 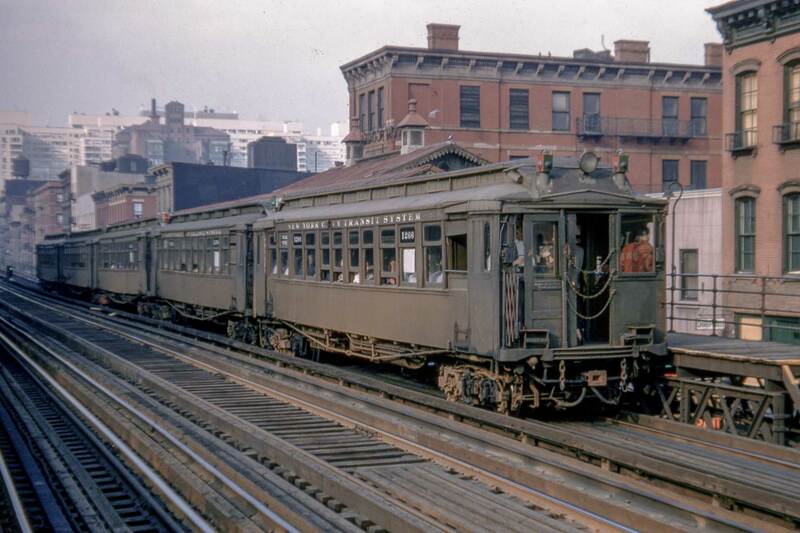 The demise of the Third Avenue El. This is a demolition view on October 20, 1974 along Webster Avenue just south of East 204th Street. The 1965 GM “fishbowl” bus in the picture would be retired about 1980. 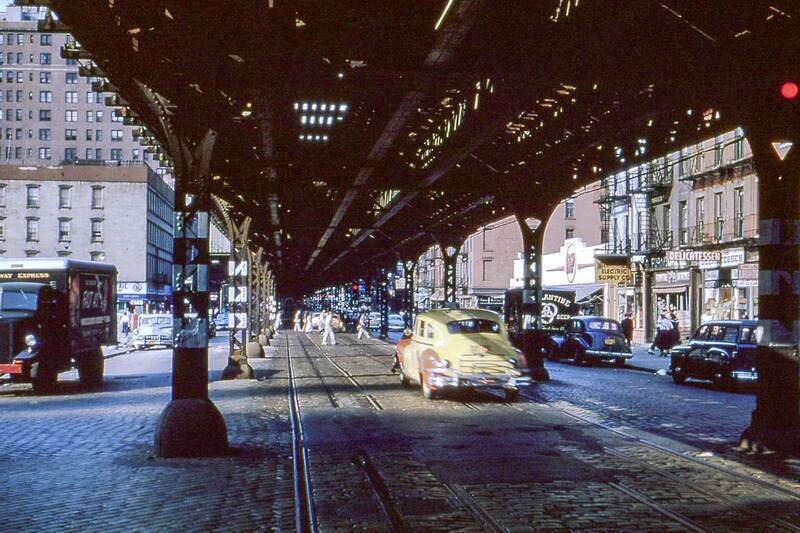 A DeSoto taxi heads northward and over the trolley tracks (the last streetcars ran in 1946) at 45th Street. The 99th Street El station northbound platform. The buildings on the east side of Third Avenue have been razed for a new public housing project, the George Washington Houses. 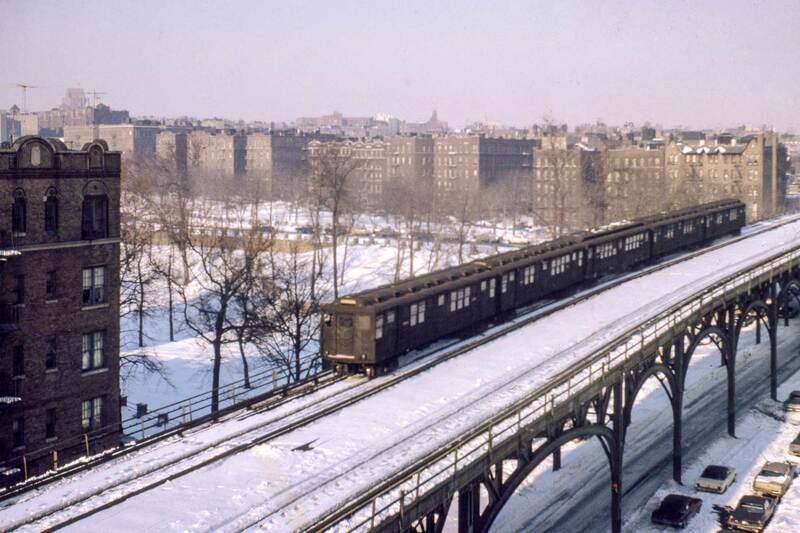 A southbound five-car train with two 1938 Steinway motors on either end with a Low-V trailer in the center is traveling on Webster Avenue while crossing Mosholu Parkway. 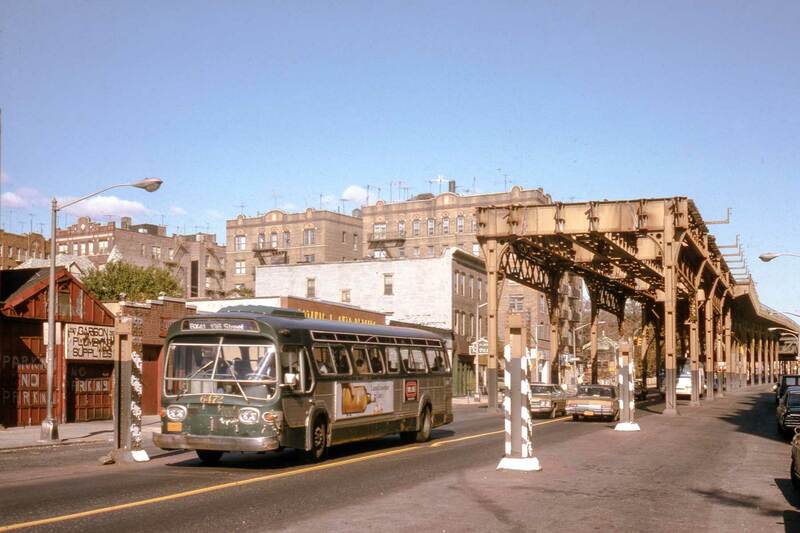 The El would close on April 29, 1973, thus ending the elevated era in New York City. 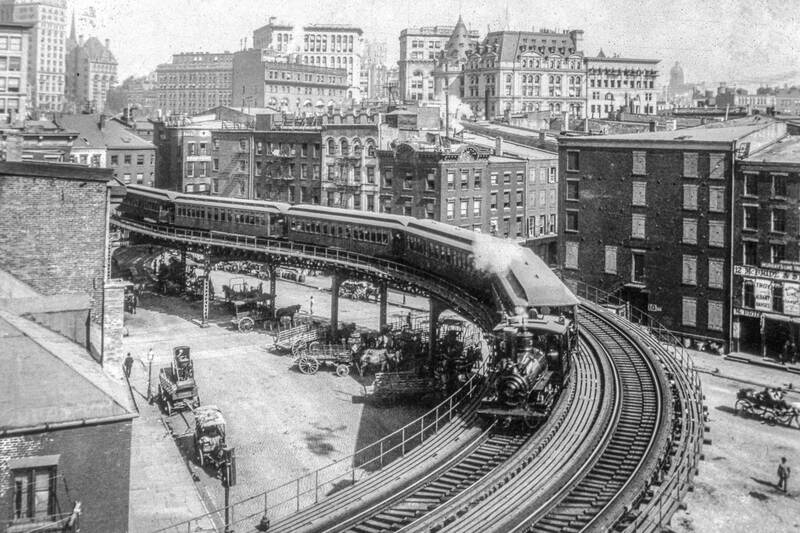 “The Elevated Railways of Manhattan,” traces the colorful history of New York’s elevated railway system from its earliest steam days until its demise. There are 372-pages of rare photos, many in color, and never-before-seen rosters of incredible detail. A must-have collectible for classic rail enthusiasts and hobbyists alike, the gorgeous El book by Eric Oszustowicz is only $59 plus $6.95 shipping. Many New Yorkers rushing through the streets of Manhattan today are completely oblivious to the fact that at one time there was an extensive elevated railway system that traversed most of the island from the Battery through Midtown, Harlem and on into The Bronx and later into Queens. Certain narrow downtown streets, such as Pearl Street, were shrouded in darkness by the elevated structure, even on the sunniest of days. 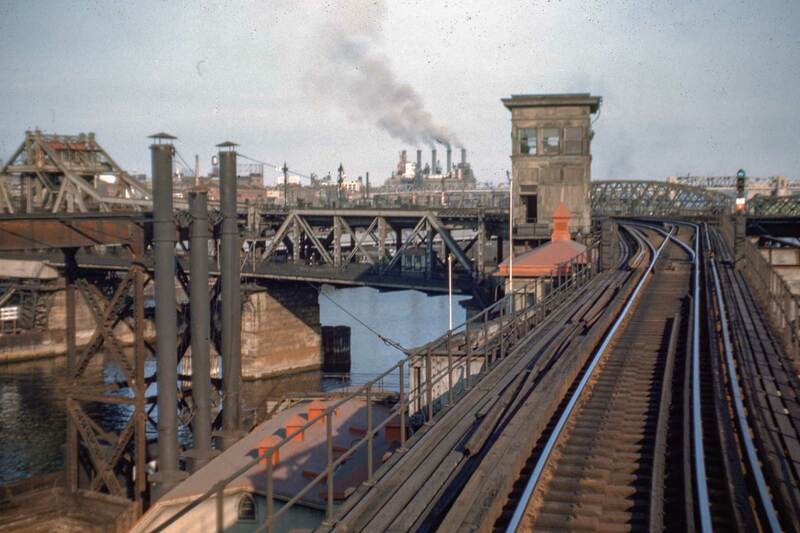 But without these elevated railways, it would not have been possible for New York City to develop as fast as it did. Development would have been delayed about 25 years until the first subways opened since there was no other way to move the massive crowds through the City. 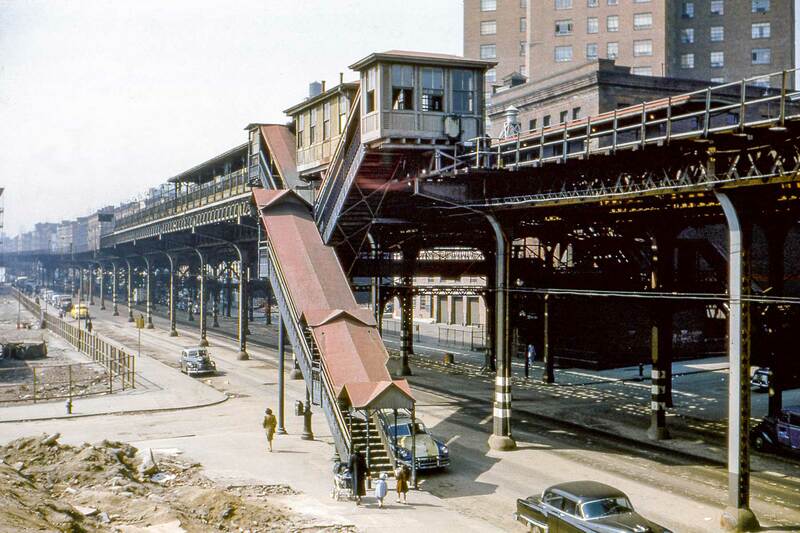 Partially due to the constant expansion of the underground subway lines and to a great extent real estate interests, the elevated lines that ran into southern Manhattan were all torn down from 1938 to 1955. 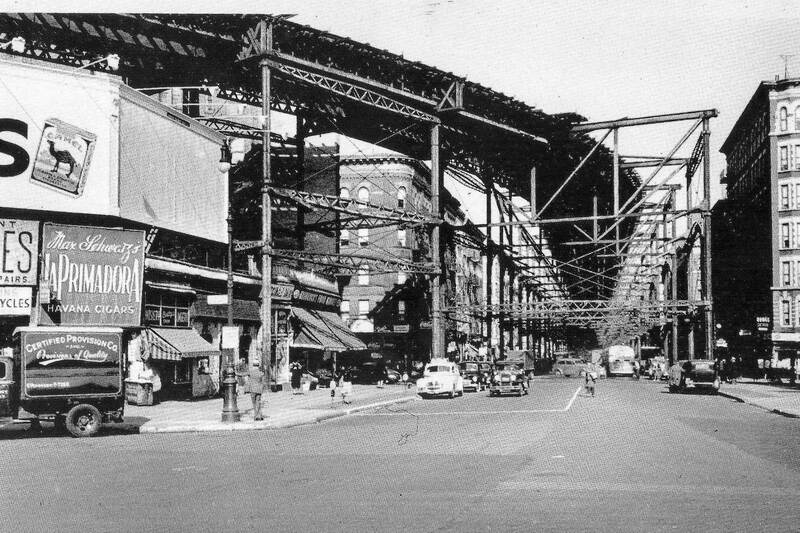 Although New York has its own unique and extreme dynamism and is one of the great cities of the world, one could only wonder what New York would be like today if one or more of the elevated lines were still standing. Here is a complete list of changes made in the second edition of The Elevated Railways of Manhattan. The line that read “Published in 2014 by the…” changed to “Published by the…” (no date) to make it easier to categorize future editions. “Sprague Library Collection” changed to “ERA Collection” since the Sprague Library was donated to Branford, except our image collection. Added: “Second Edition.” The line that read “Published in 2014 by the…” changed to “Published by the…” (no date). New ISBN number. Removed the name of the printer. The Electric Railroaders’ Association, Inc. was founded on August 15, 1934 by E.J. Quinby. The ERA is a non-profit educational organization consisting of people from all walks of life interested in the history and progress of electric railways. For more information about the ERA, becoming a member or learning about its other publications and activities, visit us online at www.erausa.org. Second period removed from end of last paragraph. Placed top photo from page 19 to the top of “Why Ninth Av?” on page 20. That eliminated a page. We created another page prior to the spreads. The 34th Street photo at the top of the page placed on a separate page after its reference on page 23 of the first edition. A view looking north across East 34th Street prior to the electrification of the 34th Street Branch. The Horse Shoer edifice on the left was located at 235 East 34th Street. The building on the right still exists, although all of the other buildings have since been demolished. At the end of the train despatchers line, change left bracket “[” to right bracket “]”. Then & Now sequence at bottom deleted. Pages 138 and 139 swapped to maintain geographic order. In the first sentence, “on the left” deleted. Changed “106th” to “125th” and moved photo to follow the photo on page 149 of the first edition to maintain geographic order. Reference to “following page” removed.